Whale watching has taken over many fishing communities in Cape Town. It’s one of the biggest tourist attractions on the outskirts of Cape Town. For locals and tourists alike, witnessing these majestic creatures swim by is truly a magnificent sight. Here are a few spots to visit during whale season. Cape Agulhus is home to hiking trails that can take you along the dunes, beaches and cliffs that offer the best views of mammals and their offspring. About 50 pairs of Southern Right cows and calves are known to swim in these waters near the southernmost tip of Africa. One of the most popular spots for whale watching, False Bay, is not too far from the city of Cape Town. For a better chance at spotting them, choose a high vantage point along the False Bay coastline which includes Boyes Drive that runs between St James and Kalk Bay. Hermanus offers some of the best land-based viewing opportunities because the whales often come within metres of the shoreline. 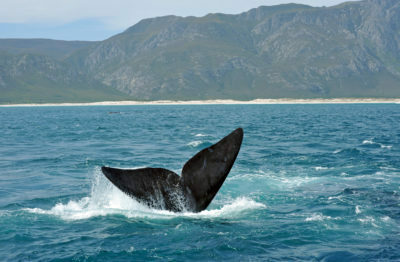 World Wildlife Fund rated Hermanus as one of the top 12 whale-watching locations in the world. Whale crier alerts watchers to the presence of whale by blowing on a kelp horn. During the first week in October, the town hosts an annual whale festival which is considered a celebration of all things cetacean. The road above Slangkoppunt Lighthouse has awesome views and excellent whale watching spots. The high vantage point offers great views of the whales. One of the most spectacular coastal roads on the plannet running between Noordhoek and Hout Bay. Amazing views of Hout Bay and all the way to kommetjie. This is also excellent spot for Mountainside vantage viewing. Vineyard Car Hire can help take you to these amazing spots for a rare whale-watching experience that is second to none. Find the spot that works for you and enjoy. Vineyard Car Hire offers a reliable car hire service, perfect for your venture to the mountain side vantage points.